Previously, I’ve mentioned the University of London’s Live-Net fibre optic cable system that once connected London’s Universities, from a central BT switching system at Senate House. Recently I’ve discovered the Thames Television news item that covered the official opening on 28 May 1987 and this can be seen below. During the opening event three sites were initially seen on screens in Senate House: Royal Holloway; Imperial and Queen Mary. Strangely enough I don’t recall us taking any photos during this event and therefore this is the only record of the day. 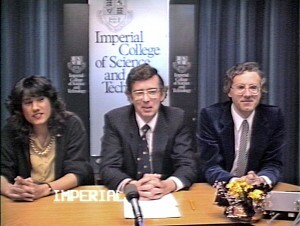 And if you look closely at the central screen with Imperial on it you’ll see me over on the right hand side. My academic colleague Prof Ernie Freeman was sitting in the middle and played host for our site. The image on the right is an off-screen grab of that central screen’s video feed. Closely linked to the Live-Net technology was Westminster Cable TV. This was also a BT technology and Live-Net borrowed and improved upon that domestic system. In fact it’s closely related to our current Broadband FTTC where optical fibre brings the internet to a local street cabinet and from there it arrives at your home via copper phone lines. In Live-Net’s case it arrived directly with us as a fibre feed termination. So what is my connection with Westminster Cable TV? Well, because of the on-going BT involvement with both Live-Net and Westminster Cable TV I got to know everyone on both projects. I was approached to sound out how an experiment might be operated to utilise a unique option that existed for the cable TV customers. That was the ‘theoretical’ ability to run video FROM the customer backwards to the Westminster Cable TV hub. Indeed the local equipment in the TV Studio had those sockets on the box, but BT had never pursued the idea. It did work when we tried it, but the image quality at the other end was apparently dreadful and unusable. 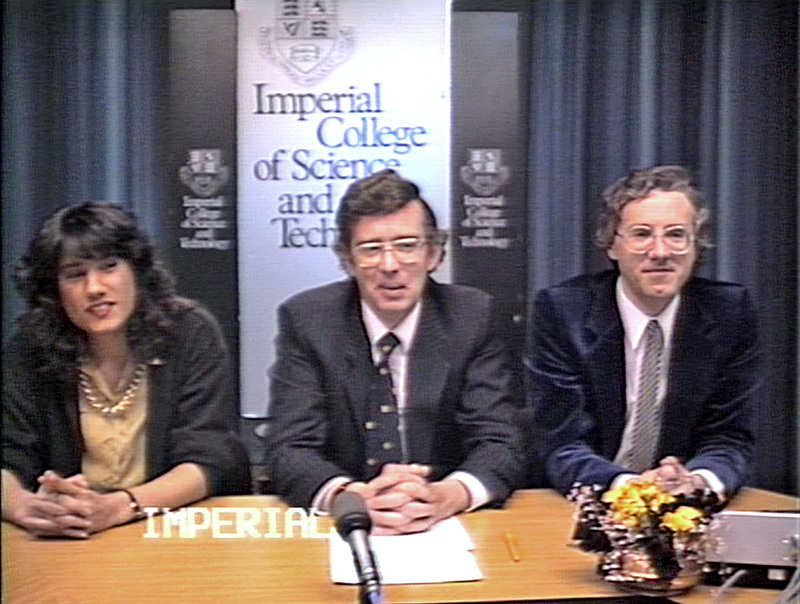 In September 1990 we’d already agreed to run an experimental computer training ‘at home’ series, that was sponsored by the Training Agency. Everyone was on board, but the ‘reverse line video feed’ technology had, by then, failed us. My BT research labs colleague stepped in and had the ability to order a direct point-to-point microwave link from the top of the Electrical Engineering Building and by using this, our studio feed hopped across Hyde Park to Westminster Cable TV in Paddington. We took live incoming phone questions too via the earpiece that was worn by Kevin Hamilton. I ran the pre-recorded opening sequence that included the Westminster Cable TV animation logo. The engineers at the other end had to switch a regular channel (A7) to accept my studio feed. Thus you’ll see my instructions on the countdown clock to remind them what to do and when. And yes, this might remind you of the 1977 STOIC News series that I also did live, using the ILEA cable TV system that fed all of the London Schools and Colleges. Soon, I’ll go on to talk about the Olympus Satellite project, the Live-Net uplink ground station at Silwood Park and yes, you guessed it, more live TV from the TV Studio, but this time to Europe! So, yet more educational ‘firsts’ that have, so far, gone unmentioned (until now). Thanks for the interesting article. My late Father was a project manager with BT on the Westminster Cable project until he retired in the 90s. The optical fibre system was streets ahead of anything else that was available at the time, and pretty much groundbreaking when one considers the modern technology which does more or less the same thing. It’s a shame he is no longer around to ask about the reverse line video feed because I am sure he would have remembered.